Gothenburg June 27th: The time is running fast and the team is working hard with different tasks. The Speed Shop orders cannot be neglected (customer first!) and the race car needs to be ready for shipping. The insight that there's only 24 hours available per day is not yet clear to all team members. Which helps.. While some were sleeping, Anders were creeping...in to the tubular system inside the Amazon and mounted the two fire extinguishers. Here they are, mounted on the surface that serves as the border between driver and dust. You can't stopp the fire without a hose. Or rather, without and aluminum tube. We have instructions, and yes, we're intending to follow them 100%! Gothenburg June 26th 2017. Two weeks left to shipping. Sunday night becomes Monday. Monday evening is now soon over. We keep on working. ...and this is how it looks from the outside. We can use these for lifting the car as well, which is really nice. Coming up; Install the fire extinguishers. Every day is a working day! Yes, we're working hard every day and every evening to finish our Landspeed racer, but it isn't painful, it's instead rewarding. Because the progress can be seen each day and that makes everyone cheery and in a good mood. And again, to relax a late evening, knowing that we've made several steps forward this day as well is nice. To reflect over a busy day with a cold beer a late summer evening is life when it's good. Especially if you in the background can hear street (turbo) machines, race bikes and muscle cars howling in the summer night. The Throne of Speed. Now with head restrictors. Doors should be possible to open. As well from the inside. 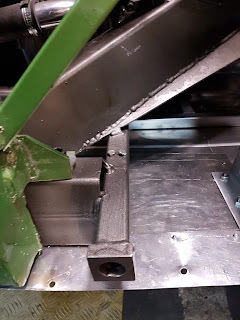 Therefore, Anders made billet lever arm in aluminum. Kalle, here in pistage green, ensure that our electrical system is transparant and free from dust. Meanwhile in another part of the workshop, Cina is making elderflower lemonade (sv. fläderblomssaft) because it's season. Anders has now completed the diffusor. Looks great. Besides working on the SSR Amazon, I managed to do some work on the C10 and the Roadster. Summer is here and the need for well working cool cars is obvious. When riding along in my automobile....and to avoid singing by my self which will scare away people, a music player was needed. 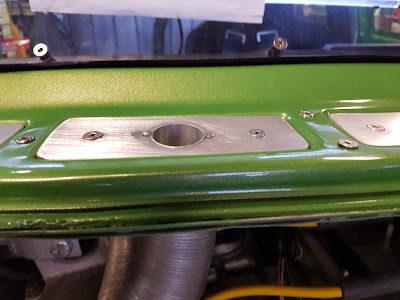 Needed parts laid out on the Camaro Z28 hood, a mix of stuff from different sources ! The Z28 is waiting for a fuel injection. More about that later on. This is the Retrosound model 2 with radio, USB, Blue tooth, and aux including phone integration. Still looking old, it turned out to be rather good although a little vulnerable due to all adjustments to fit all dash boards. Håkan has bought one for Carinas Pick-Up Truck called, Little Blue (it's a C20...). don't forget a good earth connection. Amplifier and sub woofer are waiting to find there place, the only missing on the picture are all the cables and those needs to be invisible....which ain´t as easy as it seems. Nowadays all cables seems to be borrowed from a power station. it was at least a good way to get some good sound pressure. TADA! The radio fits just fine and together with some more speakers, it'll support a summer feeling. Does it all work? Does it sound good? Well, when you combine the player with an amplifier, a subwoofer and 6 speaker it's good. Really good. Especially with a 454 big block humming softly in the background. Close shave. Not good enough. But I'll get some experience while drive the car. Nevertheless, it's time to focus on the Amazon now because the ship is soon sailing and we're not ready yet. If you're a gearhead, you're a gearhead. You're addicted to gasoline and there's no cure know to mankind. You just have to cope with the situation. But it means that you need cool machines around you continuously to stay calm. Even stressful stuff like lawn mowing, which keeps good guys from their garage, can be nice if there's an Iron Horse like a Suffolk Lawn Mower to support and soothe the soul. If you want to avoid cylinder abstinence on a sunny Sunday seek for Suffolk. Word of warning: You have to be cautious, these machines are invasive. There are thing's that are easy to resist. Like Prius, Pilates and Pokemon. A two stroke Tecumseh that hovers makes a man feel fine. A Suffolk Super Puch ain't for robot guys. Full throttle, gain speed and go ahead. Yes, they're a bit heavy. ...so that we're ready conquer dry lakes in the blistering sun, and we do make some progress right now. As it seems, a deadline is really a good thing. With less than a month to finish it all we'll only take a small break for midsummer eve before we continue to detail our Amazon. WTF is midsummer? International readers with an inquiring mind might wonder. I'd say forget it, it's just a event during which Swedes eat various types of hearing and strawberry's in pouring rain and get drunk. Nevertheless, here are today's contributions that brought us one step further on our journey to the El Mirage dry lake. 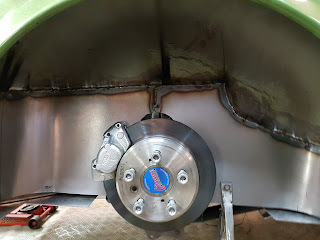 So finally, left wheel housing is complete, reasonably sealed to the Belly pan and rigid. We'd like to pass the security check and it's good to survive as well, so we build up some extra head protection. TO DO list is getting shorter. The Salt Slush Team is focused because we have a Mission. The Mission to make sure that the Amazon is as ready as can be when we're loading it in to a container and wish for the best a couple of weeks from now. Right now we're working hard to make this happen. Yes, we still use some time to shave and shower and, occasionally, we even sleep some hours. 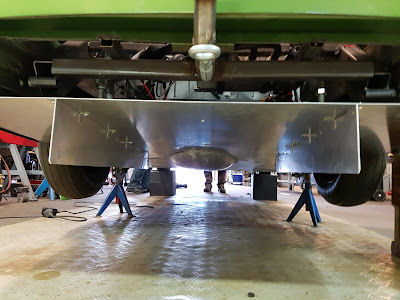 This weekend we've connected the Belly Pan with the inner fenders, we've worked and with the safety equipment, sealing the wheel housing, tightening bolts and more. But at some point, Sunday evening, we felt the urge to see the blue sky and hear the howling engine. Always rewarding. All good things have an end. The in-and-out procedure is not the only, but definitely one parameter that makes our Amazon a less good daily driver. Coming up... The long haul ! We've talked about it for a while, but now we know when we're shipping our Landspeed Amazon to Los Angeles. We now have tickets for us as well as our mean green creation. If we're ready? No, not yet. But soon. We're manufacturing our way forward piece by piece, evening by evening. The TODO list is getting shorter, but there's still a list and it ain't short yet. Luckily nights are short in Sweden right now, since we're approaching midsommar. Here's a two examples of what we've done recently. 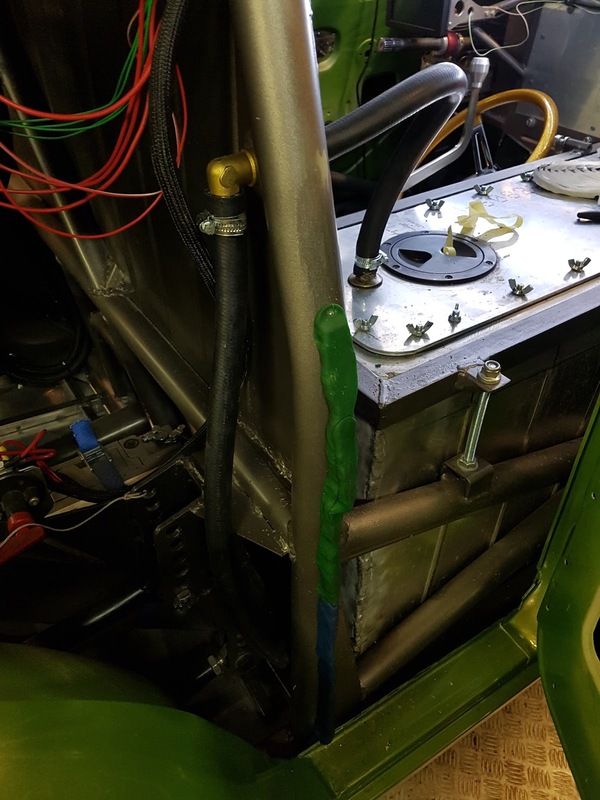 We're into sealing and hence (hopefully) reducing dust in drivers compartment. Magnus made wheel housings in the rear that match the diffusor. Yes, he has done both side, but you'll have to imagine the outer one. 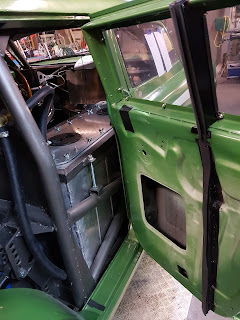 Anders has found a way to seal the rear doors against the roll cage. Yes, it took some how-are-we-going-to-do-this discussion's. Same here, use your imagination for a picture of the driver's side design. 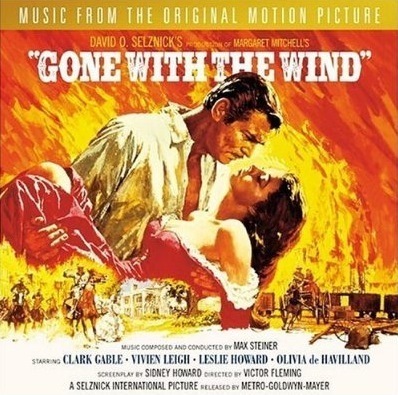 Gone with the wind with Clark Gable and Vivian Leigh is a masterpiece in the movie world and thereto connected business. Maybe not the movie we would pick. But still, a lot of drama. Our latest focus was to manage the wind and the dust. 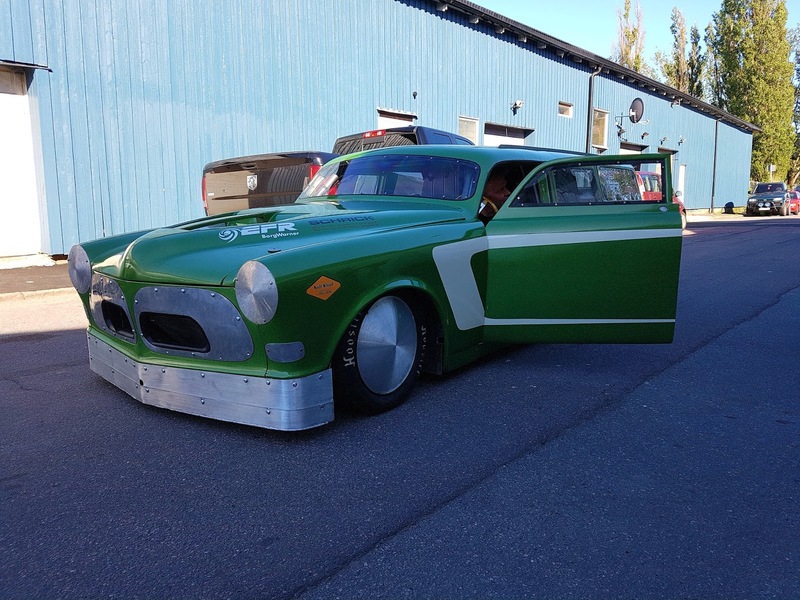 From the source of wisdom (Hot Rod Magazine) we picked up some useful information and that is that too much dust in the driver compartment can make it hard to drive fast. This wisdom created a lot of actions. We concluded that we'll need to use the wind to manage the dust and hence make the dust go away with the wind. Regarding the movie, or the book, we probably should have picked something from John Steinbeck Grapes of Wrath since the wind and the dust is what we need handle like they did by approaching Los Angeles. All tough we have another reasons to go there. One dilemma, referering to the literature above, is that these stories are brutal. No happy ending there. Not the type of story we are to create. We hope. But first some pro bono work. We needed to provide some help to a car guy with a lost soul. A warped MG cylinder head...British engineering is as close to controlled trouble as you can get. Designed for a good story in the pub after being rescued. Nevertheless, Magnus sorted it out while constantly singing God save the Queen as the milling machine was humming. Anders SAJO milling machine takes all troubles away. Always. Magnus's steady hand brought back the greatness to the British Engineering. A good thing to have at times with election Hallabaloo and Brexit in the UK. Here's Håkan while creating a device to capture the wind and get some pressure in the cabin. The idea is to use the area in front of the windshield, all according to books of wisdom (among them Hot Rod Magazine) as a high pressure zone. The pressure device soon in an high speed Amazon close to us. the beautiful air guidance in front to get the hot wind out. 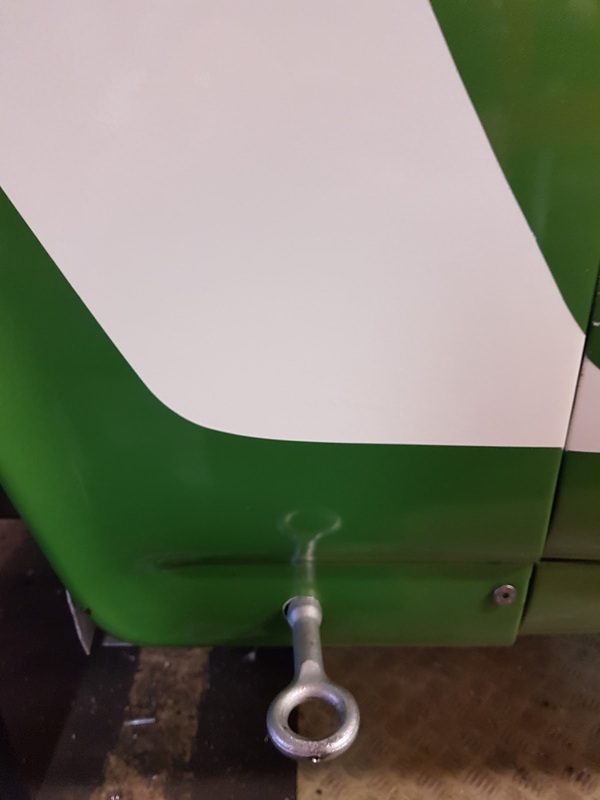 To enable over pressure in the cabin it needs to be sealed. Here's Anders while using the latest state of the art technology to figure out the geometry and to seal the deal. The deal of dust if you know what I mean. Kids Dough is something every garage needs. 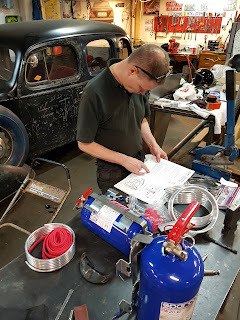 Janne is making miracles with his Bonneville, a time capsule bobber that is an awakening program...... More info when it starts. We try to understand what is happening. Anders is checking up formulas to size the possible pressure from Håkans pressure device. It will make some difference according to Anders. Ok what is this ? Well, Anders has returned to childhood and salt dough. 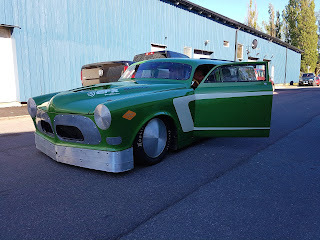 Soon to be converted in to ol´ sheet metal. My cooling tank has now a pressure valve / hose. Support the law physic's. Summary: Let's end this day with a well known Gone with the Wind quote " After all, tomorrow is another day" and even though we're not going to California to pick grapes we're intending to go fast and create a dust bowl and as a consequence we're shipping the SSR Amazon on a slow boat to LA like there was no tomorrow. The day after tomorrow, today it's the day after yesterday or the day before tomorrow.